1. Blitz the basil, garlic and olive oil in a small food processor to make a paste. Transfer to a bowl and fold in three-quarters of the cheese, the lime juice and hazelnuts. Season and set aside. 2. 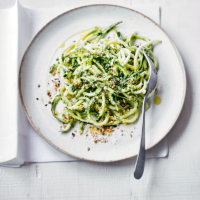 Cook the courgette spaghetti according to pack instructions. 3. Add the pesto and mix thoroughly. Sprinkle with the remaining cheese, some hazelnuts and ground black pepper. Serve immediately.